If you have set up multiple brands, by default, the Knowledge Capture app searches the Help Center of the brand set on the ticket. You can change this behavior to search based on the agent's last selected brand in the Knowledge Capture app. This might be useful if you have all of your content in one Help Center, and not in each branded Help Center. When you change the default behavior, the first search an agent does in the Knowledge Capture app uses the default brand. When an agent changes the brand for a search in the Knowledge Capture app, that brand becomes the default when they open a ticket and search in the Knowledge Capture app. You must be an administrator in Zendesk Support to change app settings. Click the Admin icon ( ) in your sidebar, then select Apps > Manage. 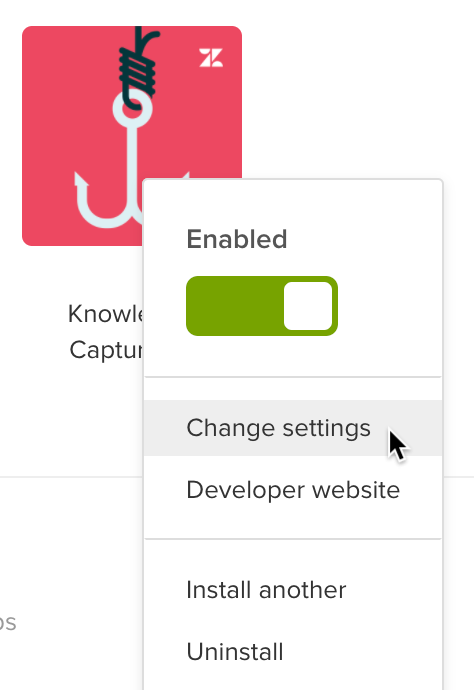 Click the options menu on the Knowledge Capture app, then select Change settings. In the settings page, click App Configuration. Deselect Auto-select brand for search. is it possible to turn of the auto-search depending on the ticket subject? On Lite, the search results are pre-populated based on a search of the ticket subject. On Professional and Enterprise, the search results are pre-populated with Answer Bot-powered article suggestions, based on the requester's most recent comment. More information can be found in our Searching and linking articles using the Knowledge Capture app article which I've linked for you.